The fourth W Club doll is Looks A Plenty! Poppy Parker - 3 dolls in one! This is the way a new year should start: a beautiful new doll! And when it is actually three dolls combined into one, even better. That’s the case with the fourth W Club doll, announce on the first day of 2019 to Club members. Poppy gets the Adéle treatment: the set consists of one doll plus two additional heads with busts and three different outfits. Of course Poppy only has one sculpt, but the body does have interchangeable feet: it comes with both high heeled and flat feet, to better accommodate all three looks. A completer pack is also offered: for $30.0 one gets two partial bodies (torso, legs and arms) to make the three dolls complete. It’s a good price for three Poppy dolls: getting both the giftset and the completer set means 229/3=76.33 per doll. Not bad at all. Let’s check out this beautiful set. Bonus! Extra Set of Lower Legs with Articulated Ankles Included! Three separate Poppy Parker doll heads, each featuring fully rooted hair and hand-applied eyelashes (each comes pre-mounted on its own bust piece). MUSEUM PODIUM STAND INCLUDED WITH EACH GIFT SET:As mentioned in the description above, the gift set includes a museum podium stand that allows you to display not only the complete doll on her telescoping "saddle stand", but also display the other included portraits "museum style", on stylish acrylic podiums. The busts insert on a peg at the top of each podium, creating a showcase for any of your dolls. This is my favourite of the three looks, both as doll and outfit. I have a soft spot for red heads. She does remind me of the redhead included in another triple giftset, Mood Changers. This is the evening look, with the upswept hair and the gorgeous polka dot gown and it’s A-line shape. David Buttry confirmed on Instagram that this Poppy’s face is inspired by the screening originally used in Summer Magic Poppy. The dress is a 1964 Balenciaga Haute Couture gown. Blue hair! This one looks a lot like a colour variant w Club 2018 upgrade doll Soda Pop Poppy - different outfit of course. She even has a soda bottle. 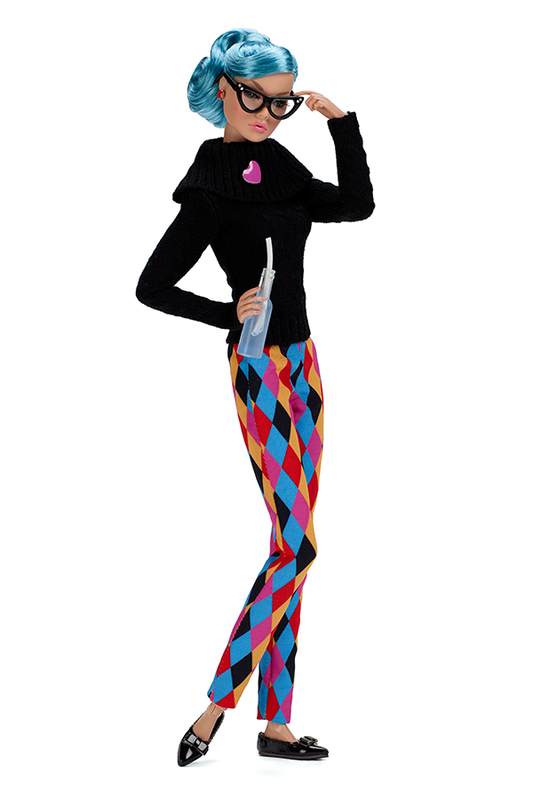 Love the harlequin pants and the cowl neck sweater. Now there are three Poppy dolls with fantasy coloured hair - this one (blue), Ciao Poppy (pink) and one of the Mood Changers (lilac). Cannot wait to photograph them all together. This is the simplest and most versatile one. I’m not crazy about the lingerie but it is something missing from my collection. The doll is lovely and with the long, flowing hair and relatively softer make up, will be able to wear many different outfits. She does remind me of To The Fair Poppy a bit. Offer Type: W Club Exclusive pre-order. Participation Deadline: January 9th, 2019, Noon Eastern time. Special Gift Set Pricing: $199.00 USD + S & H per gift set. ($30 NRD deposit per gift set due now, balance of $169.00 + S & H per gift set due approximately late-spring 2019). Optional Body Completer Pack Pricing: $30.00 USD + S & H per completer pack. ($15 NRD deposit per completer pack due now, balance of $15.00 + S & H per completer pack due approximately late-spring 2019). Final Edition Size: To be determined, will be based on all pre-orders received. Shipping Timing: Approximately late-spring 2019. Availability: 2018 W Club members only. Order Limit: Up to 1 gift set and 1 body completer pack per membership. Final fabrics, colors and textures may vary slightly. For adult collectors ages 15 and up only. All text and information contained herein is copyrighted Integrity Toys, Inc. and Intercap Merchant Partners, LLC 2018 and may not be reprinted or disseminated without express written permission. FASHION ROYALTY, POPPY PARKER, NU. FACE, EAST 59TH, THE INDUSTRY and all other character marks followed by ™ or ® are trademarks of Integrity Toys, Inc. Chesapeake City MD USA 21915. All rights reserved. The W Club is a trademark of Intercap Merchant Partners, LLC. All rights reserved. This year the most awaited Integrity Toys event takes place in Portland, on the west coast of the USA. Attendees and organisers travelled far to,reach the convention grounds and the party is just getting started. Social media started buzzing with the first photos from early arrivals yesterday and today, first official day of the event, we get the first full post. Convention registration started Wednesday for those arriving early and everyone was welcomed by receiving the "THE LOVE OF LUXE" Veronique doll in their welcome bag, along with a monogrammed acrylic chair accessory. If she had different colours in her make up, she’d look great. The outfit is boring and the accessories not anything to write home about. Not a great debut for a luxe themed event. I like the lucite chairs, especially those mimicking Philippe Starck’s Louis Ghost, but I’m not sure about the monogram treatment. We finally get to see the convention Upgrade doll that was available for pre-order when registration started. "A Fabulous Life" Rayna Ahmadi doll made her appearance and every W Club member, attending or not, could pre-order her last spring. Having figured out the outfit from the initial Integrity sketch, I was excited and waited anxiously to see the final result. And while the doll is perfection (black hair, pale skin, red lips, Rayna sculpt, duh) and the execution looks great (draping and proportions seem exquisite), the main element of the dress is not red as in the original. Instead it is a pale violet/beige that makes the outfit flat and boring. Really guys? If it was a matter of possible trouble with copying, just make it another bright colour: emerald green, cobalt blue, saffron yellow. I’m very disappointed with this choice. Other than that, I’m glad I got her, she is the best doll revealed in the convention yet (and that includes the rest of the doll’s in this post). Next up is the 2018 Convention Collection: Dolls from the Fashion Royalty® Collection were designed by Jason Wu himself (Eugenia, Tatyana, Kyori, Vanessa), the NU. Face™ Collection by Jessy Ayala (Giselle), the East 59th® Collection by Chris Stoeckel (Victoire) and the Poppy Parker™ Collection by David Buttry. I like her face and hair, the outfit not that much. Glad to see convention doll’s with bags for a change. The shoes look like those worn by the Vero given at registration. The ensemble gives off an Yves Saint-Laurent vibe, from the old days. It just need some big gold and enamel cuffs to set it perfectly. This one also reminds me of older Yves Saint Laurent collections. Ruffles, black and red, ribbons, fishnet stockings, bright make up. Just pile up the bangles and add a gold heart shaped brooch and Yves and Loulou would be proud. This will look great with the red, heart shaped coat from last year. And here’s your basic Optic Verve Agnes clone. In a more youthful look, yes, it’s Giselle after all. I like the doll but not the dress. A beret with a mermaid gown? Not very luxe. And the transparent long skirts in gowns died a few years ago on the Met gala steps. But look at that face. Gorgeous. This is the doll with the most buzz in social media so far in the convention. People are going gaga about her. For me, she’s ok but not better than Rayna or Kyori (my other favourite). Or the other Poppy that was unveiled today (more below). I think the hair colour is wrong for this outfit. But it’s just me. Love the necklace. The new Victoire sculpt makes its second appearance this year. And looks even better in this emerald concoction that reminds me of fashions worn by Gene Marshall. Beautiful doll and lovely gown. Her widow’s peak and skunk striped hair fit her perfectly. She has the new type gloves that look amazing with this kind of fashion. The necklace could be a green version of the one worn by Take The Picture Funny Face doll. And finally the IT Direct Souvenir Shop Exclusives. It has almost become a given for the last few conventions that a few more surprise dolls are unveiled in the salesroom alongside the main collection and this year there are three of them. What a gorgeous Kyori. Great face and hair and a dress that reminds me of the McQueen copy dress from the Heist convention. Same hairstyle as Kyori but in a fierce Titian red for Vanessa. Vibes of Obsidian Society combined with Cruise Control. Fantastic looking Poppy Parker doll, in ice blue and silver. Hair styling is like Misty Hollows Poppy, while elements of the ensemble bring to mind Out Of Thos World Poppy. She has a bag (fluffy!) and a suitcase! Note: All dolls pictured in these photos are prototypes; final colors and textures may vary slightly. Almost a month ago, W Club members had finally received information about the eagerly anticipated webinar presentation of Integrity Toys dolls. Four line were to be presented in the event, which was held on August 25th, with Carol Roth presiding and all designers present so that they could talk about their respective lines and also answer questions in the Q&A session at the end of the event. I am doing a separate post for each line and one for the event doll. I will give you all available information on the dolls plus my opinion on them, and welcome yours in the comments. Let’s kick off the posts then with the first line presented, THE INDUSTRY™: The Lovesick Collection, designed by David Buttry! The line also sets the overall tone for the Style Lab coming up in the convention. All these dolls are available to preorder through Integrity Toys dealers, which you can find here. My first overall impression: more daring and improved from the previous, debut collection. I’m taking a wild guess here, that the line debut did not go quite as expected and, along with the complaints about the demise of Dynamite Girls, it led to a mix of the two, hence the refreshment of the line up with familiar old sculpts, both DG and legacy ones like Janay. It also helps with the economic aspect. Price is up, all across the lines, which is an issue with many collectors. That, combined with the fact that the dolls will arrive shortly and the convention looming, surely affects spending this year. Oh, did I mention Tulabelle is getting a new sculpt? It will be unveiled at the convention. Weird to change a sculpt only a year after it premiered, I mean there was not a backlash against it like, say, Vanessa 2.0.
f Rufus’ return at the 2018 convention this Fall! 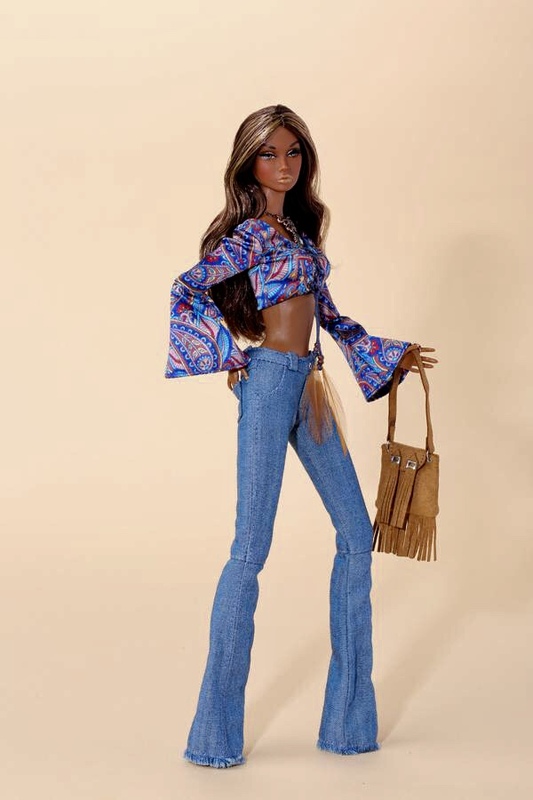 Janay is the doll that started Integrity Toys, hence she has a special place in its history. I am happy that they found a place for her into regular collections and hope to see more of her in future releases. I love this one and preordered her. Both as an ensemble and separately the clothes and accessories (that pearl chocker!) have lots of potential and the doll is gorgeous. David said during the presentation that the top bun can come down and brushed back so I’ll probably do that at some point (says the guy who still has Style Renaissance Adéle untouched). Oh and Lovesick is the name of the new single that she releases with her new group. Janay 3.0 sculpt was used in JEM and ITBE releases, so it’s a bit weird that this is the 2.5 version. Or it’s probably a typo in the release email and the version is 3.5 just like the following doll, meaning the same face as 3.0 but a smaller head. Alysa is another legacy sculpt from the early Integrity Toys lines. She is now a part f The Industry line like Janay and looks beautiful here. The whole collection is inspired by the work of Alessandro Michele at Gucci, with this outfit being the most emphatic example. 3.5 for the sculpt means she is the same as her previous appearance in ITBE 2015, but with a smaller head. Jade is another legacy sculpt of Integrity Toys, the third in this lineup. All these old faces have been redone to make the heads smaller, in order to match the rest of the heads in The Industry. Jade used to be the Asian sculpt but she looks more Latino here. The outfit looks very Gucci again, with the tee logo and the head band the most obvious references. At the beginning of the presentation, David and Carol mentioned that one of the DG sculpts coming over to The Industry is Rufus Blue, which is a collector’s favourite. Imagine the surprise when the doll that opened the show was a new male doll, Bellamy Blue, who is Rufus’ brother. Everyone drooled over this gorgeous doll (referred to in the stats as Fashion figure), and with good reason. He is handsome, gorgeously dressed (amazing parka, fantastically embroidered shirt, printed t-shirt) and has great accessories (the bag, the glasses, the frat ring, the boots). What’s not to like? With the new Hommes collection just around the corner, it’s good to see that more great male dolls are part of the other collections as well. I preordered him and will be happy to add him to my collection. The Gucci bag is the icing of this very tasty cake. So what do you think of the new Industry dolls? Are you getting any and if yes, which ones? The dolls pictured are prototypes. Final fabrics, colors and textures may vary slightly. For adult collectors ages 15 and up only. All photos and information contained herein is copyrighted Integrity Toys, Inc. and Intercap Merchant Partners, LLC 2018 and may not be reprinted or disseminated without express written permission. IFDC 2018 - four new Poppy Parker dolls unveiled! The IFDC convention took place from 27 till 30 of June 2018 in Las Vegas. This year, as usual, Integrity Toys made the convention and companion doll’s as well as the centerpiece plus one more IT Direct doll- and they were all Poppy Parker dolls! They were unveiled late Saturday night by the company team, another small collection created by the talented David Buttry. Every attendee also received a table gift from Integrity Toys, an exclusive Poppy scaled guitar designed just for the event. The four dolls make a very coherent group, all hippie themed, appropriately enough for the psychedelic theme of the convention. I like the variety of skintones and styles, even though a Darla with a big afro would have looked better than another black Poppy. They have different feet between them, the first has the high heeled foot, while the rest of them have the articulated foot to better match their shoe style. Always remember that lower legs are interchangeable and can pop out to be replaced with another type, if you desire. Regarding the new hand sculpts introduced for this collection: meh. They have no use than maybe one or two poses and that’s it. Plus they do not look as realistic as her normal hands, but more cartoony and almost weirdly squished. What do you think? Since the number of dolls made is larger than the attendees, the remainder is to be available through lottery to W Club members only. So if you are not a member, you will have to try the secondary market for them. The lottery will be held approximately in ten days and members have until the 25th of July to pay the dolls. Let’s see the dolls that were presented. I like this one, although, as mentioned earlier, a Darla with a huge afro would have looked better for me. Doll and outfit are great and would make a nice addition to the collection. Love the hat, it is very Jacquemus and will match other summer styles well. I’m still undecided about which doll I will enter the lottery for, but this one is ahead at the moment. This was the centerpiece doll so her edition is the smallest, only 350 dolls. I’m not entering for this one, the dress print reminds me of a couple of previous dresses and her colouring matches a couple of my Poppies too. Easy pass. If her hair colour was darker, she’d be a dead ringer for Lana Del Rey, flowers on the head etc. She’s beautiful and has the Hungarian skintone that makes her different from blond Poppies with pale make up I have. Her earrings and bag are gorgeous. I’m not crazy about the dress though and the braids in her hair mean less versatility. As I mentioned earlier, all IFDC attendees received an exclusive bonus souvenir gift, a 60's themed guitar designed to fit with this quartet of dolls. This accessory is not available online,but there's a picture of the centerpiece doll with the guitar in-hand. The dolls pictured are prototypes. Final fabrics, colors and textures may vary slightly. For adult collectors ages 15 and up only. All photos and information contained herein are copyrighted Integrity Toys, Inc. and Intercap Merchant Partners, LLC 2018 and may not be reprinted or disseminated without express written permission. FASHION ROYALTY, POPPY PARKER, NU. FACE, EAST 59TH, THE INDUSTRY, FR: Nippon, Misaki and all other character marks followed by ™ or ® are trademarks of Integrity Toys, Inc. Chesapeake City MD USA 21915. All rights reserved. The W Club is a trademark of Intercap Merchant Partners, LLC. All rights reserved. Doll Photography by Jayme Thornton. Layouts and graphics by Alain Tremblay, Marketing. Poppy Parker 2018 City Sweetheart capsule collection reveal! We knew that this year’s Poppy Parker collection theme would be something relevant to New York, as it was already announced back in the 2017 convention. And indeed, during the first Poppy reveal of the year, we discovered that the new collection is named City Sweetheart and it finds Poppy dressed in a variety of outfits for various occasions around the Big Apple. It is a small, capsule collection*, with four dolls available via dealers ( three in August and one in September) and a two-doll giftset available via right-to-buy lottery from IT Direct in late summer. I love two of the dealer dolls and the giftset, while the other two leave me cold. All doll’s have the high heeled foot, a first for a regular Poppy collection. There will not be a second wave of dolls in this collection as David mentioned, but the four IFDC Poppies, two W Club ones and the IT convention ones will be more than enough for the rest of the year. * capsule collection is a condensed version of a designer’s vision, often limited edition, which transcends seasons and trends by being functional - read commercial. It’s made up of a few pieces which can be easily combined and interchanged. Let’s see the collection dolls in detail, shall we? Bonus Accessory: miniature "poetry book"
This is the best doll of the collection and one of the best Poppy Parker doll’s ever released. Both doll and fashion are perfect and the accessories are fantastic! A book! That bag! The pendant! New cat eye sunglasses! Only minus: the dreaded, delicate, prone to break small hoop earrings. Her style is refined beatnick; the real thing would wear flat ballerina shoes. Bonus Accessories: school pennant, "pencil" and "books"! Second favourite doll from this collection! I love everything about Co-Ed Cutie, from her skintone and make up to her outfit and amazing accessories! More books! A pencil! Cat eye glasses! A watch! Her blouse print resembles molecules, a nice nod to her studies, emphasised by her Physics book! I’m confirmed for both this and Off Beat, which is great! 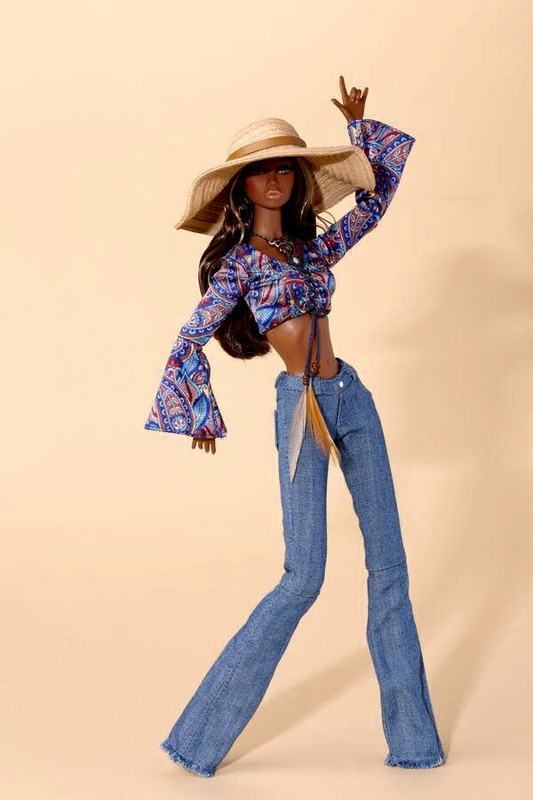 During the Q&A session in the W Club forum that followed the presentation email, David Buttry said her skintone does not match Sweet Confection body, just in case anyone was thinking about using the body for a replacement. Not liking this one very much. It’s probably the styling and colours that don’t make her pop out to me. She has the new sculpted gloves hands that finally put an end to the oven mittens we amassed over the years. Peach is my all time least favourite colour, so I definitely don’t like this one. She’s very washed out with her pale skin and colouring, so not even the doll attracts me like other pale Poppies before her, who at least had a smokey or better defined eye to make them appealing. I like the shawl like detail around her shoulders. And it seems over mittens stick around for longer gloves, instead of the new type we saw in the Vanessa FR giftset with the sculpted hand and fabric arm. Why should this ugly thing continue? The plain accessories make this one even more boring. What a lovely giftset! I’m a sucker for anything green, so the colour was the first thing that struck me, with its great combinations and bright hue. Darla looks gorgeous here, in her capri pants, bright accessories and flamboyant hairdo. Poppy compliments her nicely, if more demurely so, with her lovely striped dress, brooch and sublime straw clutch. I will enter the lottery for these two ladies in late summer. So which ones are your favourites? Did you manage to get them? Let me know with a comment. All photos and information contained herein is copyrighted Integrity Toys, Inc. and Intercap Merchant Partners, LLC 2018 and may not be reprinted or disseminated without express written permission. FASHION ROYALTY, POPPY PARKER, NU. FACE, EAST 59TH, THE INDUSTRY and all other character marks followed by ™ or ® are trademarks of Integrity Toys, Inc. Chesapeake City MD USA 21915. All rights reserved.